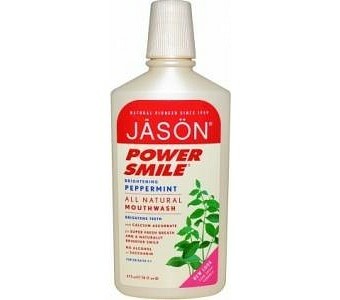 Show off that beautiful smile with Jason Powersmile Brightening Peppermint Mouthwash. This all-natural mouthwash contains peppermint oil and menthol to freshen up your breath, while natural grapefruit seed and perilla seed extracts assists in preventing tartar buildup. It?s not harsh like those other mouthwashes, as the aloe vera gel helps soothes gum irritation. It?s great in preventing gingivitis and getting rid of bad breath. It?s really simple to use PowerSmile?, just brush your teeth daily and gargle twice a day to get gleaming white teeth and super fresh breath. Made with certified organic ingredients Naturally brightens teeth with calcium ascorbate and enhances fresh breath Contains no alcohol and saccharin Ingredients: Aqua (Water), Glycerin, Polysorbate 20, Aloe Barbadensis Leaf Juice*, Calendula Officinalis Flower Extract, Carica Papaya (Papaya) Fruit Extract, Citrus Grandis (Grapefruit) Seed Extract, Echinacea Angustifolia Extract, Hamamelis Virginiana (Witch Hazel) Water, Hydrastis Canadensis (Golden Seal) Extract, Perilla Ocymoides Seed Extract, Mentha Piperita (Peppermint) Oil, Ascorbic Acid, Calcium Ascorbate, Menthol, Sea Salt, Sodium Bicarbonate, Xylitol.